Ted Thompson would not be characterized as a risk taking general managers by most who follow the Green Bay Packers, but he has shown a willingness to give second chances. Yesterday, Thompson signed former Oregon tight end Colt Lyerla to a contract after a two day tryout. Lyerla was considered to be one of the most talented tight ends in this year’s draft class, but went undrafted due to his shady background. 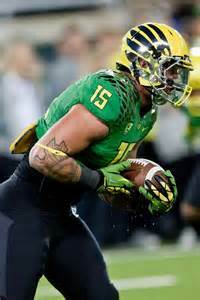 Lyerla abruptly quit the Oregon football team after being suspended for violating team rules and was later arrested for cocaine possession. The 6-foot-4, 247 pound tight had the third fastest 40-yard dash (4.61 seconds), the best vertical jump (39 inches) and tied for the best broad jump (10-8) among the tight ends at the NFL Combine. However, nobody was willing to risk the investment of a draft choice in him. Thompson gave second chances to Koren Robinson and Johnny Jolly, and neither let him down by getting into trouble again. If Lylerla shows even a hint of a bad attitude or trouble off the field he can be cut at a moment’s notice. The Packers have no financial investment in him nor did they invest a pick in him, so it would do them no harm to cut Lyerla. The reward far outweighs the risk in this situation. The Packers have a pretty big need at tight end, so if Lyerla can get his act cleaned up he has a very good chance to make the team. He will be competing against Andrew Quarless, Brandon Bostick, Ryan Taylor, Jake Stoneburner and third-round pick Richard Rodgers. That group has proven very little in the NFL. Lylera has the ability to stretch the defense vertically down the field, and only Bostick has shown that he the capability of doing that so far. He averaged 16.6 yards per catch during his days at Oregon. Also, Lylera showed a knack for getting into the end zone in college, as he caught 11 touchdowns during his first two seasons. He can be a huge red zone threat at 6-foot-4, and the Packers struggled in the red zone last season after they lost Jermichael Finley. This is most likely Lyerla’s last chance to live out his NFL dream. Thompson’s hope is that he realizes this and will be on his best behavior. People can change, and Thompson must be comfortable with what he has seen and heard from Lyerla in order to bring him aboard. Lylera will certainly be one of the most intriguing players to watch this summer. He has a chance to be an incredible story of redemption and to turn his life around. Let’s hope he makes the best of it. This entry was posted in Matt Bove, Packers 2014 - 2015 Season and tagged Colt Lyerla, Jake Stoneburner, Richard Rodgers. Bookmark the permalink. Great read–but I believe it’s Koren, not Korean.